Cloudbytes is a Webinar/Webcast for the APAC region which would be held monthly for all the CSA chapter members. The CloudBytes program will look to bring the most important topics to the forefront for education and discussion. Security is one of the major barriers to cloud adoption and transformation when we think IT risks in order to contribute to business outcome. Especially recent drastic increase of the number and impact of cyber-attack is one of the major security risks in WW. On the other hands, we still also face with huge damage from internal threat and human errors have occurred frequently in a long IT history. In the cloud days to create complexities and transformation, ad hoc and spot protection are not enough to manage total security risk but it is the necessary point to think about security infrastructure totally with flexibility and scalability. 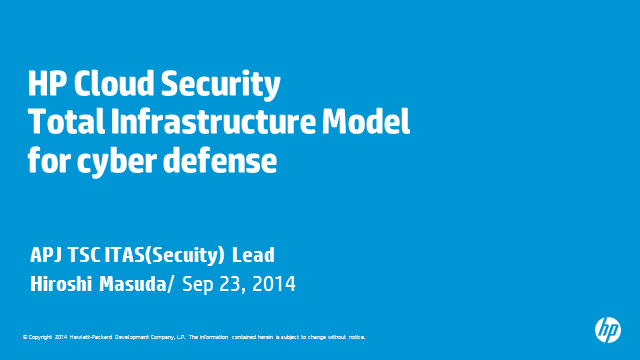 Guest experts can discuss what is the “to-be” architecture for total security infrastructure including cloud specific threat protection and how HP can support for that.